​ It just makes common sense." Dedicated to the Memory of Frederick Sweet, PHD. Dr. Frederick Sweet's brilliant, imaginative formative research back in 1980 on the effects of ozone on cancer cells, including breast cancer cells, showed some promising results. Unfortunately, Dr. Sweet and his team were unable to continue their critical research. EDITORS' NOTE: THERE ARE MANY WAYS TO USE OZONE. PLEASE CONSULT WITH A KNOWLEDGEABLE MEDICAL PROFESSIONAL BEFORE PURCHASING OR USING ANY OZONE DEVICE! HAVE STAGE 1- 3 BREAST CANCER? After surgery to remove their tumors, 104 breast cancer patients, with varying stages of breast cancer, embarked upon ozone therapy. Results? "Ozone therapy can effectively reduce the TK1 level of breast cancer patients after resection, inhibit the proliferation of tumor cells, control the disease progression, and it is more significant for patients with stage I to III." "A recent study compared the changes of serum TK1 levels in patients of breast cancer with resection after ozone therapy and the relationship between the changes of TK1 and tumor stage. Researchers found a significant difference between the levels before and after ozone. They concluded that ozone therapy can effectively reduce the TK1 level of breast cancer patients after resection, inhibit the proliferation of tumor cells, control the disease progression and it is more significant in patients with stage 1 to 3. Ozone therapy is safe, effective and affordable. Ozone does not cause cancer." while ozone has THREE atoms of oxygen. ​J.D., a friend of Breast Cancer Study and Support, had an MAH (major autohemotherapy) treatment, which entails taking some blood out, ozonating it, and returning it to the body. ​J. D. described her blood as looking like "dark wine red" when it was being removed. ​J. D. described her blood as looking "cherry red" - fully oxygenated - when it was returned to her body following the ozonationprocedure. 1. Dr. Guggenheim, if a breast cancer patient has had surgery to remove her tumor, and has declined chemo and radiation, what kinds of ozone therapy do you offer? (Dr. Hulda Clark recommended whole body ozone bagging, even bagging of the affected breast.) And how many ozone treatments does a breast cancer patient typically have? We offer high dose MAH major autohemotherapy, vaginal, rectal and bladder insufflations, limb bagging, add-ons including: glutathione, Vitamin C - low, moderate and high dose, homeopathic nosodes specific for breast cancer and other cancers too. Our I.V. ozone therapy is highly effective as we can deliver up to 750 ml of ozone safely at different gamma ranges from 20 to 86 and above. We offer white and red ozone treatments. We begin with 250 ml of ozonated saline loaded with individualized homeopathic injectables followed by blood drawing with heparin and finally ozonating the patient's drawn blood. Treatments take about an hour. During our I.V. treatment patients receive ozone inhalation because diseases and medicines cross the blood brain barrier. I am not aware of any other clinic offering this full service package. We follow all American Academy of Ozone Therapy guidelines. All patient must go through an intake and be seen by our doctors before they receive I.V. therapies. Cancer is a systemic disease so I would not choose limb bagging as a frontline treatment. I.V. ozone is much more effective followed by ozone colonics and or ozone sauna. There is no set number of treatments and treatment reflects the progression of the disease. As an average, most do 10-12 MAH treatments before repeating labs and imaging. Then they move on to high dose Vitamin C drips." 2. Dr. Guggenheim, if a person does decide to do chemo and/or radiation, do you do ozone therapy at the same time as the breast cancer patient is undergoing treatment? "Those patients who choose a hybrid model do weekly or biweekly ozone treatments as ozone is not contraindicated during chemo and radiation. Our treatment protects them from severe side effects down to a cellular level. Chemo and radiation cause DNA damage which we protect with specific homeopathic formulas." 3. Dr. Guggenheim, what kinds of supplements do you feel are most important to complement ozone therapy for the breast cancer patient? "Outside of radical dietary changes and daily juicing, I recommend high quality high dose nutraceuticals like Turmeric, Broccoli seed extract, mushroom extracts, Resveratrol, probiotics and beta-glucans. There are more, but those are certainly foundational medicines." 4. What is the best way for a breast cancer patient, who would like to pursue ozone therapy, to get ahold of you? Visit us on the web for daily posts, archived blogs, free monthly phone seminars, and our virtual pharmacy.We specialize in reversing chronic disease. Your health starts here." "Cancer cells meet their energy needs by fermentation, not oxidation. Thus, they are dependent upon glucose, and a high oxygen environment is toxic to them." Low oxygen is a "negative prognostic factor" in breast cancer. So, how about using a high dose of oxygen...? In the 2017 Yttersian S et al. study, the researchers explored whether employing HBOT (hyperbaric oxygen therapy - high oxygen under pressure) would be helpful in the regulation of tumor growth and metastasis in breast cancer. For their study, the researchers used human breast cancer xenografts in mice. What are xenografts? Xenografts are human breast cancer cells - in this case, both triple positive and triple negative breast cancer cells - that were grafted (injected) in mice. Will HBOT help reduce tumor growth? After the mice had HBOT treatments for 90 minutes every third day until the end of the experiment, and "despite the fact that the behavior and prognosis of the triple positive and negative subtypes are different", there was a "similar suppressive effect on tumor growth". Was mestastasis reduced in the mice? Although there was an "old perception that it (HBOT) would facilitate tumor growth and spread", affter 16 sessions of 90 minutes of HBOT in a xenograft model of triple negative breast cancer in mice, there was a significant reduction in the "number and area" of metastatic lesions. HBOT has a "strong and similar primary tumor suppressive effect" in triple positive and triple negative breast cancer. Import? Both breast cancer tumor types "share a common oxygen dependent and tumor mechanism"
" ...The prognostic significance of reduced oxygen levels in primary breast tumors of cancer patients is well recognized." In the Gilkes DM et al. 2013 study, the researchers stated, "Human breast tumors contain regions of hypoxia (low oxygen) in which cells that are located far from a functional blood vessel have significantly reduced oxygen concentrations when compared with normal mammary tissue." In fact, the researchers observed that "the mean partial pressure of oxygen in breast tumors ranges from 2.5 to 28 mm of mercury, with a median value of 10 mm mercury, as compared with 65 mm mercury in normal breast tissue. Intratumoral partial pressure of oxygen values of <10 mm mercury have been associated with an increased risk of metastasis and mortality." Why is there low oxygen in a breast cancer tumor? "Hypoxia within a solid tumor arises from an increase in oxygen utiliztion due to an increase in rapidly dividing cancer cells, and a decrease in oxygen availability due to structurally and functionally abnormal vessels that form within solid tumors. Oxygen availability decreased as distance from the nearest blood vessel increases." So, what happens when there is low oxygen? "Breast cancer cells adapt to hypoxic conditions by increasing levels of hypoxia-inducible factors (HIFs), which induce the expression of multiple genes involved in angiogenesis, glucose utilization, resistance to oxidative stress, cell proliferation, resistance to apoptosis, invasion, and metastasis. Breast cancer patients with increased HIF expression levels in primary tumor biopsies are at increased risk of metastasis." These hypoxia inducible factors appear "to play a role in every step of the metastasis cascade". And, "HIF-1a expression has been implicated as an independent predictor of poor outcome for breast cancer patients." Thus, it is known that these hypoxia-inducible factors are involved in metastasis. But, in order to metastasize, the cells must be able to go into a new environment (some organ), and be able to survive. Not so easy. In fact, for circulating tumor cells, "... only a small subset for micrometastases and only a subset of these micrometastases form vascularized macrometastases. Cancer cells that have survived and have been reprogrammed by hypoxic conditions have a survival advantage at distant sites." The clinical evidence is that having high HIF-1a levels will have a "greater likelihood of developing metastatic relapse and a shorter survival time". OXYGEN BACKGROUND: LOW OXYGEN AREAS IN BREAST CANCER TUMORS CREATE HYPOXIA-INDUCIBLE FACTORS THAT TRIGGER PROTEINS THAT HELP BREAST CANCER CELLS GROW "HANDS" AND MOVE AND METASTASIZE!
" ...Low oxygen levels within cancer cells trigger the increased production of two proteins—RhoA and ROCK1. These proteins are known to give cancer cells movement and the ability to easily spread." "Caption: In low oxygen conditions, breast cancer cells form structures that facilitate movement, such as filaments that allow the cell to contract (green) and cellular ‘hands’ that grab surfaces to pull the cell along (red)." ​The Gilkes DM et al. study cited above found not only that breast tumors may have areas of low oxygen, but that cells that are re-programmed in low oxygen in the primary breast tumor have a survival advantage at a distant metastatic site. But how did these hardy breast cancer cells actually physically move, make it to the metastatic site? It was another Gilkes DM et al. 2014 study that found that in areas of low oxygen in the primary tumor, hypoxia-inducible factors triggered RhoA and ROCK1 proteins that changed the shape of the breast cancer cells, allowing them to grow "hands" to help in their metastatic voyage. In the Johns Hopkins Press Release, the prominent hypoxia researcher and team member, Gregg Semenza, MD, commented, “ 'The lack of oxygen activates the hypoxia-inducible factors, which are master control proteins that switch on many genes that help cells adapt to the scarcity of oxygen.' He explains that, while these responses are essential for life, hypoxia-inducible factors also turn on genes that help cancer cells escape from the oxygen-starved tumor by invading blood vessels, through which they spread to other parts of the body." Long known is that high levels of the proteins, RhoA and ROCK1, which worsen a breast cancer patient's prognosis, give the tumor cells the ability to move. "What the study showed is that low oxygen conditions, which are frequently present in breast cancers, serve as the trigger to increase the production of RhoA and ROCK1 through the action of hypoxia-inducible factors." (Note that the hypoxia-inducible factors actually bind to RhoA and ROCK1.) And, " 'As tumor cells multiply, the interior of the tumor begins to run out of oxygen because it isn't being fed by blood vessels, ' ” Dr. Semenza stated. Hypoxia-inducible factors not only help the cells to adapt to the low oxygen, but the hypoxia factors help the tumor cells to escape through the blood vessels." "Thin, parallel filaments form throughout the cells, allowing them to contract and cellular 'hands' arise, allowing cells to 'grab' external surfaces to pull themselves along." Plus, it was even "found that the (tumor) cells were much more mobile in the presence of low levels of oxygen than at physiologically normal levels. They had three times as many filaments and many more 'hands' per cell". Chilling structures! In their 2016 study, Xie J et al. explored hypoxia and breast cancer cell stemness in hormone-negative breast cancer cells. "Self-renewal is a fundamental attribute of CSCs (cancer stem cells) and has been demonstrated in xenograft animal experiments and colony-formation assays. Colony-formation assays reveal cells with the proliferative activity to form clones, such that the colony-formation rate reflects the proportion of cells with stemness. ​In the present study, we showed that hypoxia significantly increased the colony-formation rate and therefore the proportion of cells with stemness properties. We also measured hypoxia-induced changes in the percentage of BCSCs in MDA-MB-231 (estrogen-negative) cells using flow cytometry analysis. Our results further confirmed the ability of hypoxia to increase the percentage of BCSCs in MDA-MB-231 cells and facilitate stemness transformation. ...​Hypoxia is a major feature of solid tumors and exerts multiple effects on the biological behavior of tumor cells. Our experiments showed that hypoxia had no significant cytotoxic effect, but did inhibit apoptosis and regulate stemness in cancer cells. Hypoxia is a major feature of solid tumors and exerts multiple effects on the biological behavior of tumor cells. Our experiments showed that hypoxia had no significant cytotoxic effect, but did inhibit apoptosis and regulate stemness in cancer cells"
The researchers encourage exploring "hypoxia as a mechanism which might not be underestimated in chemo-resistant breast cancer treatment". ​OXYGEN BACKGROUND: THE 2015 HATFIELD TEAM STUDY - BREATHE EXTRA OXYGEN PLUS USE SOME "SUPER-CAFFEINE" PRODUCT FOR ANTI-TUMOR EFFECTS IN MICE? REGRESSION OF SPONTANEOUS METASTASIS FROM ORTHOTOPICALLY (GRAFTED) GROWN BREAST TUMORS?" "Hyperoxia facilitates the infiltration of adoptively transferred T cells into 11-day established pulmonary tumors. .... From B: The average infiltration from -100 tumors was 249 cells/mm2 in control mice and 723 cells mm2 in mice breathing 60% oxygen. From C: Breathing as low as 40% oxygen results in pulmonary tumor regression. 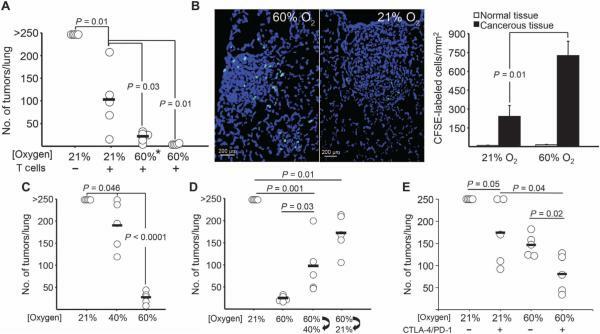 From D: Alternating between breathing 60 and 40% oxygen or 60 and 21% oxygen every 12 hours enables tumor regression compared to mice continuously breathing 21% oxygen. Breathing 60% oxygen continuously (24 hours/day) causes the strongest antitumor activity." Add oxygen? ....... Yes, according to the Hatfield S et al. 2015 study. Extra oxygen along with wake-up "super-caffeine" (an antagonist of the A2A adenosine receptor) shrinks tumors! Wouldn't just giving extra oxygen work? But, in areas where there is low oxygen, cancerous tumors have a nasty trick, namely a compound, adenosine, to put the tumor killer cells to sleep when they come to try to kill the cancer cells. Maybe the reason that the anti-tumor effects of oxygen alone are not always successful could be that there is still some residual influence of adenosine on the immune system. Thus, extra oxygen PLUS supplementing with an anti-adenosine compound are needed for stronger anti-tumor effects. Laura Neergaard, in a 2015 article in Bioscience Technology, wrote, "Tumors can grow so rapidly that they outpace their blood supply, creating a low-oxygen environment. The lack of oxygen in turn spurs cancer cells to produce a molecule called adenosine, which essentially puts nearby tumor fighters called T cells and natural killer cells to sleep, explained pharmacologist (and co-author) Edwin Jackson." .... The researchers wondered if "just getting more oxygen to an oxygen-starved tumor could strip away that defense. So they put mice with different kinds of lung tumors inside chambers that mimic what's called supplemental oxygen therapy. Air is about 21 percent oxygen, but hospitals can give patients concentrations of 40 percent to 60 percent through masks to treat various disorders. The extra oxygen changed the tumor's environment so that immune cells could get inside and do their jobs...."
In a Science Daily article, the long-time prominent oxygen researcher, Michail Sitkovsky, PHD,, a member of the team, stated, "The anti-tumor effects of supplemental oxygen can be further improved by the natural antagonist of the A2A adenosine receptor, which happens to be the caffeine in your coffee. People drink coffee because caffeine prevents the A2A adenosine receptor in the brain from putting us to sleep." Barry Krans, in a 2015 article, summarized researcher Michail Sitkovsky PHD's comments that "delivering 60 percent oxygen - the amount used in hospitals - could improve tumor rejection by flipping the tumor environment from hostile to permissive." As reseacher Sitkovsky stated, " 'The solution was embarrassingly simple. ' "
EDITORS: "Tumors often express unusual antigens and are surrounded by immune cells. Unfortunately, this immune surveillance is imperfect and does not always prevent the tumors from growing. In addition, tumors are often hypoxic, because their rapid growth outstrips that of their blood and oxygen supply. Now, Hatfield et al. have linked these two phenomena by demonstrating that T cells avoid going into the hypoxic areas of tumors. The authors have also shown a way to overcome this problem in mice with lung tumors by having the animals breathe supplementary oxygen. Having a higher concentration of oxygen throughout the body improved the oxygenation inside the tumors, allowing immune cells to enter the tumors and attack them, extending the animals' survival." Importantly, There was "improved lung tumor regression and long-term survival in mice. Respiratory hyperoxia also promoted the regression of spontaneous metastasis from orthotopically grown breast tumors." The researchers noted that these results are "entirely T cell-and natural killer cell-dependent, thereby justifying the testing of supplemental oxygen as an immunological coadjuvant to combine with existing immunotherapy for cancer." *SOME OF THE PROBLEMS WITH LOW OXYGEN (HYPOXIA) AND THE BENEFITS OF ADDING OXYGEN HAVE JUST BEEN DESCRIBED. "Ozone therapy has been in use since the 1800s and, in 1896, the genius Nikola Tesla patented the first O3 generator in the US, later forming the "Tesla Ozone Company". During the first world war (1914-18) doctors familiar with O3's antibacterial properties, and with few other medical resources available to them, applied it topically to infected wounds and discovered O3 not only remedied infection, but also had hemodynamic and anti-inflammatory properties. In the late 1980s, reports had emerged that German physicians were successfully treating HIV patients with O3-AHT (autohemotherapy)." . AM Elvis and JS Ekta, 2011. OZONE THERAPY - WHAT IS OZONE?
" Ozone in air pollution is AIR POLLUTION. It is also a reflection of many volatile toxic organic compounds in air pollution which are highly toxic. No one would quarrel that air pollution is toxic. We do not administer air pollution medically. We administer ozone generated via medical grade oxygen (100%), so it is free of noxious organic pollutants which ozone in smog reflects It is NOT administered into the lungs as is pollution, but given in any number of methods to other parts of the body or blood." ​ Robert Rowen, MD, 2015. ​ "Ozone is a reactive form of oxygen that exists naturally as a trace gas in the atmosphere. It is perhaps best known for its crucial role absorbing ultraviolet radiation in the stratosphere, where it is concentrated in a so-called ozone layer - protecting life on earth from solar radiation." "The oxygen you breathe is present in the air as a pair of oxygen atoms. This is the most stable form of oxygen, and it's colorless. Ozone is a blue colored form of oxygen (it's what makes the sky blue), and unlike regular oxygen, it is composed of three oxygen atoms instead of two. It is the addition of the third oxygen atom that makes ozone 'supercharged' oxygen, and gives it all of its remarkable medical properties." ​ "Complementary therapy in all cancers. Through direct tumoral-inhibiting effect of oxygen-ozone mixtures, by anti-tumor effect of oxygen-induced interferon production by enormous increase in immune cells and enzyme release. High doses of ozone are able to reduce both primary cancer tumors and cancer metastasis. You can achieve amazing success in late stage cancer." "1. Ozone therapy improves red cell flexibility, meaning your blood will flow much better. RBCs (red blood cells) will be able to flex better to get through the small capillaries. They will carry a higher negative electrical charge so that they repel each other and don’t stack together. This improves rheological (flow) properties of your blood, enabling more oxygen transport. ​3. Ozone therapy increases RBC ATP. The increased energy in the red cells enable newly created RBCs to become 'supergifted' in the words of researcher Velio Bocci, MD of Italy. OZONE THERAPY - CAN OZONE KILL BACTERIA? ​"According to microbiological research data, the ozone is capable of killing all the known types of gram-positive and gram-negative bacteria, including the Pseudomona aeruginosa and Eschericea coli; both bacteria are tremendously resistant to antibiotics. The local disinfectant, antiviral and antibacterial effects of ozone, therefore, are due to its germicide capacity, basically to its high oxidant capacity on the bacterial walls. This fact makes it a general broad spectrum germicide on which the classic mechanisms of microbial resistance do not act." Since a 2015 study found that 59% of breast cancer tumors harbor the bovine leukemia virus, can ozone kill this delta retrovirus? And how about the "distinct biological signatures" found in a 2015 study on triple negative breast cancer? Can ozone kill the herpes viruses, fungal families, bacteria, and parasites that defined a hierarchy in triple negative breast cancer. Plus, Hulda Clark, PHD, found not just a parasite, Fasciolopsis buski, but a myriad viruses and bacteria contributing to cancer. Can ozone kill all of these pathogens? ​OZONE THERAPY - CAN OZONE KILL VIRUSES? ​Robert Rowen, MD, wrote, "When it comes to viruses, these stealth pathogens MUST gain entry to your cells to wreak their havoc, no matter the virus. Research has shown that most viruses (at least every one I’ve looked at) require fully functional and reduced sulfhydryl groups (SH) on their outer shell to attach to and enter your cells. The SH groups are the 'fingers' viruses use to open and enter your cells according to world literature.Ozone is extremely reactive oxygen. It will strip the H off the SH as follows: SH + SH +O3 > S-S = H2O + O2. This is called 'oxidation'. The only residual product is oxygen, which your body burns, and water, so no toxicity whatsoever! If the SH groups are oxidized to S-S, the virus is inactivated. It can’t enter your cells. And that is the best thing that could happen for you. See, if the virus is present in your blood stream, but can’t enter your cells, your immune system can see them without the tissue destruction. This should enable you to mount a proper and fast immune defense and dispatch the invader without damage to you! .... I thought ozone would be a good match for Ebola. Research has shown that Ebola has the same 'Achilles Heel' as other viruses, in that it has glycoproteins (proteins with sugar attached) on its surface, which have sulfur groups that MUST be reduced to SH in order to gain cell entry." ​THE HUMAN BODY MAKES OZONE! REALLY!! FIRST WAY!! ANTIBODIES ATTACH TO NEUTROPHILS (THAT KILL BACTERIA). NEUTROPHILS GIVE SINGLET OXYGEN TO ANTIBODIES > ANTIBODIES CONVERT SINGLET OXYGEN TO OZONE TO HELP NEUTROPHILS KILL MORE BACTERIA!! ​ "Ozone had never been considered a part of biology before, but they (Wentworth P et al., 2003) had detected it to be produced by antibodies, implicating ozone in the killing of the bacteria.".
" ...In human neutrophils: Antibodies generate both hydrogen peroxide and ozone during the water-oxidation pathway which are bactericidal in combination and which makes immunoglobulins the third enzyme in the microbicidal pathway of neutrophils, after the phagocyte oxidase and myeloperoxidase . Inset is an electron micrograph of an E. coli bacterium killed by the antibody-catalyzed water-oxidation pathway. There is remarkable simile in the morphology of cell wall and membrane rupture to that of when bacteria are phagocytosed." 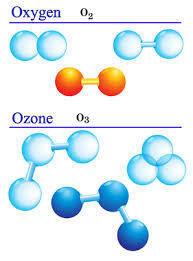 ​ So, how does the body make ozone? Antibodies are proteins that detect foreign antigens, such as bacteria, parasites, and fungi. Neutrophils are a type of white blood cell that importantly fight infections. From a Scripps Research Institute 2003 Press Release: " ...For the last 100 years, immunologists believed that antibodies - proteins secreted into the blood by the immune system - acted only to recognize foreign pathogens and attract lethal 'effector' immune cells to the site of infection." But Scripps researchers in 2003 found a novel role for our bodies' antibodies. Richard Lerner, MD, and Paul Wentworth, PHD, "demonstrated that antibodies are able to produce ozone and other chemical oxidants when they are fed a reactive form of oxygen called singlet oxygen". And, in 2004, it was discovered that the "oxidants produced by antibodies can destroy bacteria by poking holes in their cell walls." But, how do antibodies make ozone? ​"The Scripps research team knew that in order to make the ozone and other highly reactive oxidants, the antibodies had to use a starting material known as singlet oxygen, a rare, excited form of oxygen." And the researchers believed that they found the answer, where the singlet oxygen was derived from. From Babior BM et al., 2003, "Given that neutrophils have the potential both to produce singlet oxygen and to bind antibodies, we considered that these cells could be a biological source of ozone. We report here further analytical evidence that antibody-coated neturophils, after activation, produce an oxidant with the chemical signature of ozone." The singlet oxygen comes from neutrophils, which are "one of the effector immune cells ... which are little cellular factories that produce singlet oxygen and other oxidants. ​During an immune response, the neutrophils engulf and destroy bacteria and fungi by blasting them with these oxidants." From the Scripps Press Release: "The work of the Scripps scientists suggests that the antibacterial effect of neutrophils is enhanced by antibodies. In addition to killing the bacteria themselves, the neutrophils feed single oxygen to the antibodies, which convert it into ozone, adding weapons to the arsenal." ​Jason Socrates Bardi, in a 2004 Scripps Research Institute article, reported the detection of "the elusive dihydrogen trioxide in a reaction between ozone and hydrogen peroxide". Dihydrogen trioxide is a "short-lived and powerful intermediate molecule". "... Because ozone and hydrogen peroxide may both be found in vivo (in the human body) as part of an immune process whereby the body produces oxidants in order to kill invading microorganisms. Since ozone and hydrogen peroxide mixed together can form dihydrogen trioxide, and since ozone and hydrogen peroxide can be found in living systems, dihydrogen trioxide may also be a part of biology,"
As background, when test tube antibody experiments found that singlet oxygen, "during normal metabolic processes" could form hydrogen peroxide, the thought was that antibodies could do more than just surveil the bad guys, like bacteria, since oxidants kill pathogens. But, "The amount of hydrogen peroxide the antibodies generated was not enough to kill the number of bacteria they observed dying. So perhaps the antibodies were producing other oxidative species as well." And that is when the researchers discovered the OZONE signature. "Since ozone and hydrogen peroxide are both part of biological systems, and since dihydrogen trioxide has now been detected in the reaction of hydrogen peroxide and ozone, it stands to reason, says Paul Wentworth,PHD, (a Scripps researcher) that the powerful oxidant dihydrogen trioxide may be a biologically relevant molecule present in biological systems and acting as an oxidant in the immune system’s reaction against bacteria." In the 2008 Yamashita K et al. study, the researchers "discovered that 4 amino acids themselves were able to catalyze the production of an oxidant with the chemical signature of ozone from singlet oxygen in the water -oxidation pathway, at comparable levels to antibodies." "Our results further suggested the hypothesis that amino acids themselves exhibited catalytic activity to convert singlet oxyghen and water to an oxidant with the chemical signature of ozone, and amino acid-catalyzed oxidant with the chemical signature of ozone showed bactericidal activity in human neutrophils." ... In human neutrophils we examined, the bactericidal activity induced by the addition of amino acids was prominent when larger numbers of E.coli were added to neutrophils... Thus, ozone produced by neutrophils might potentiate a host defense system when the host is challenged by high doses of infectious agents." Conclusion: Thus, "The resultant oxidant with the chemical signature of ozone exhibited significant bactericidal activity in our distinct cell-free system and in human neutrophils. The results also suggest than an oxidant with the chemical signature of ozone produced by neutrophils might potentiate a host defense system, when the host is challenged by high doses of infectious agents. Our findings provide biological insights into the killing of bacteria by neutrophils." ​"OZONE THERAPY FOR BREAST CANCER: IT JUST MAKES COMMON SENSE"
Veronique Desaulniers, DC, believes that ozone therapy "makes sense" for breast cancer patients. We have shown in this OZONE THERAPY section that when there are low oxygen levels in tumors that more proteins are made that promote tumor growth. More oxygen is needed! Veronique Desaulniers, DC, wrote, "In 1966, Otto Warburg, a Nobel Prize-winning doctor from Germany, put the relationship between cancer and oxygen this way: 'Cancer cells meet their energy needs by fermentation, not oxidation. Thus, they are dependent upon glucose and a high oxygen environment is toxic to them.' "
Thus, "Based on this statement alone, it just makes sense that a healing modality that infuses internal environments with oxygen might shrink tumors and help heal cancer. And in the simplest terms, this is exactly what ozone therapy (and other oxygen-depended therapies like hydrogen peroxide) may do- with extremely positive results." She concluded, "When it (ozone) is used in conjunction with a healing diet and other modalities ..., the fact that ozone's super-oxygenating qualities might stimulate and modulate the immune system, clear the blood, reduce tumors, and help heal the body overall, is a real no-brainer." ​OZONE THERAPY - 1980 OZONE-CANCER CELL STUDY - HOW SWEET IS THE SWEET STUDY ON OZONE AND CANCER CELLS, INCLUDING BREAST CANCER CELLS!! "In 1980, the journal Science published Ozone Selectively Inhibits the Growth of Human Cancer Cells. The study showed that ozone inhibits the growth of human lung cancer, breast, and uterine cancer cells." In the Sweet F et al. study, cancer cells were "selectively inhibited in a dose-dependent manner by ozone at 0.3 to 0.8 part per million of ozone in ambient air during 8 days of culture". Results: "The presence of ozone at 0.3 to 0.5 part per million inhibited cancer cell growth 40 and 60 percent, respectively." Healthy lung cells were unaffected. NOTE THAT NT ARE THE NOT TREATED TUMORS, WHILE THE CONTROL GROUP RECEIVED DISTILLED WATER, AND THE O3 - OZONATED WATER - TUMORS SHOWED THE HIGHEST RATE OF NECROSIS. ​ In the Kuroda K et al. 2015 study, the researchers "conducted a study on the safety of ozonated water and its anti-tumor effects using a tumor-bearing mouse model and normal controls." " ....Local administration of ozonated water (20.8, 41.6, 104, or 208 mM) directly into the tumor tissue induced necrosis and inhibited proliferation of tumor cells. ... The size of the necrotic areas was dependent on the concentration of ozonated water." Import of necrosis? "In a previous report, a decrease in metastasis and an extension in the duration of survival were observed in a mouse tumor necrosis model compared to a mouse tumor apoptosis model. Therefore the induction of necrosis rather than apoptosis by administration of ozonated water is very useful in tumor immunity." Conclusion: "In this study, it is suggested that ozonated water has an anti-tumor effect. There is a possibility that it is exerted through the production of ROS. Moreover, ozonated water has low toxicity and is safe and easy to handle." Plus, there weren't any "detrimental effects in normal tissues". Therefore, "We believe that administration of ozonated water is a safe and potentially simple adjunct or alternative to existing antineoplastic treatments." BACK IN 1998 - OZONE PRECONDITIONING BEFORE GIVING CARBON TETRACHLORIDE, A POISON, TO RATS! "OZONE COMES TO TYPIFY A UNIQUE DRUG." In the Leon OS et al. 1998 study, the researchers, in an effort "to demonstrate the capability of O3 (ozone) to promote an oxidative pre-conditioning process, introduced hepatocellular (liver) damage with a single dose of carbon tetrachloride (CC14), which is a recognized organic agent able to produce cellular injury through generation of free radicals." Repeated oxygen-ozone administration "via colorectal route can induce a sort of cross tolerance to free radicals released after one single dose of carbon tetrachloride. On the contrary, experimental groups treated with either carbon tetrachloride or oxygen + carbon tetrachloride, respectively, displayed significant cellular damage". HAVING ANY RADIATION AT ALL? OZONE THERAPY - 2013 STUDY: CAN OZONE BEFORE RADIATION AMELIORATE DAMAGE? ​Yes!..... According to a 2013 study, pre-conditioning with ozone is a radioprotector! "Because radiation-induced cellular damage is attributed primarily to harmful effects of free radicals, molecules with direct free radical scavenging properties are particularly promising as radioprotectors." And the Gultekin FA et al. researchers, knowing that "controlled ozone administration may promote an adaptation to oxidative stress, preventing the damage induced by ROS, .. hypothesized that ozone would ameliorate oxidative damage caused by total body irradiation with a single dose of 6gy in rat liver and ileum (small intestine) tissues." What the researchers were experimenting with is called "pre-conditioning". In a terrific article, Frank Shallenberger, MD, discussed pre-conditioning with ozone as elaborated in this study. "Pre-conditioning is when people are treated before they get sick in order to prevent them from becoming sick. Wow, what a concept! The researchers knew that radiation damages tissues through the action of free radicals. They also knew that the most effective way to combat free radical damage is by using ozone therapy. And so they did a very simple thing. They pre-conditioned a group of rats with ozone therapy for five days. Then they exposed them and an unlucky group of rats that had no ozone pre-conditioning to a single whole body dose of 6Gy (Grey units) of radiation. This is a huge exposure. Keep in mind that acute radiation poisoning happens at doses over 0.1 Gy. This dose was 60 times the upper limit! After the exposure, the researchers measured the effects of the radiation in al of the rats." Results? Dr. Shallenberger commented, "Not surprisingly the radiation in the untreated rats caused a significant increase in the levels of free radicals and a significant decrease in the levels of the enzymes, such as SOD (superoxide dismutase), which the body used to protect itself from free radical damage. And what happened to our little pre-conditioned critters? They did much better. In the words of the authors, 'The results demonstrated that the levels of free radicals in liver and ileal tissues significantly increased'. But that's not even the most amazing part of the study." Here is the "amazing" part of the study.... "When they looked at the actual radiation damage that happened to the livers and small intestines of the pre-conditioned rats, the ozone 'reversed all histo-pathological alterations induced by irradiation'. This means that there were absolutely no signs of any damage at all in any of the pre-conditioned rats. This is simply astonishing." Conclusion: From the study, "In conclusion, data obtained from this study indicated that ozone could increase the endogenous antioxidant defense mechanism in rats and thereby protect the animals from radiation-induced organ toxicity." * Dr. Shallenberger posed the question: "And why is this so important? One reason is obvious. If you have cancer and are regularly getting radiated with either CT scans or radiation therapy, you can protect your body from all of the negative effects by pre-conditioning with ozone." ​OZONE THERAPY - BISPHOSONATES FOR BREAST CANCER, THEN DO DENTAL WORK, WITH POSSIBLE OSTEONECROSIS OF THE JAW LESION OZONE THERAPY RESPONSE RATE IN OSTEONECROSIS OF THE JAW IS 75%! Osteonecrosis of the jaw may occur in breast cancer and other cancer patients receiving bisphosphonates (antiresorptive drugs aiming to slow or stop the dissolving of bone tissue) and denosumab. In the Ripamonti CI et al. 2012 study, the researchers evaluated the effects of ozone on patients who had been treated with the bisphosphonate, zoledronic acid, and developed osteonecrosis jaw lesions >2.5 cm. There is always a chance that breast cancer patients taking bisphosphonates can develop osteonecrosis of the jaw. In this study, specifically, 24 patients, including 11 patients with breast cancer that had metastasized to the bone, who hadn't had any benefits from standard therapy, were treated with medical ozone treatment "delivered as gas insufflations on each osteonecrosis jaw lesion". The ozone treatment was given "every third day for a minimum of 10 for each pathological area or till necrotic bone sequestrum (dead bone tissue) or surgery. In 12 patients with the largest and deeper lesions, O 3 gas therapy produced the sequestrum of the necrotic bone after 10 to 38 insufflations; surgery was necessary to remove it (11 patients). Of interest, removal was possible without the resection of healthy mandible edge because of the presence of bone sequestrum. All together the response rate was 75.0% In all patients treated with O 3 gas ± surgery, no osteonecrosis of the jaw relapse appeared (follow-up mean 18 months, range 1–3 years). Conclusion: This study "shows that the topical insufflation of ozone medical gas on osteonecrosis jaw lesions >2.5 cm is able to produce a sequestrum of the necrotic bone with 1. its spontaneous or not traumatic explusion and the healing of the gum mucosa followed by re-epithelialization 2. or surgical removal of the necrotic bone and healing of the gum mucosa. This is an effective and original method, in the absence of observable toxicity. Thus, medical O 3 gas insufflations appears to be an effective and safe treatment for patients treated with bisphosphonates who developed ostenecrosis jaw lesions >2.5 cm". Changes in "pre (upper)- and post (lower)-ozone treatment provided more objective assessment of the changes than palpation i.e. decrease in thickness and dimensions of the induration/fibrosis area." There was a case of a persistent PORT-a-CATH A-related fistula and fibrosis in a breast cancer patient. Surgery can have side effects along with delayed healing. Hyperbaric oxygen is "cumbersome" and not always available. So, the Clavo B et al. researchers, in 2012, decided to use ozone! Conclusion: These researchers "described a case of a persistent fistula in a previously irradiated area, which was refractory to treatment but which was successfully treated with local ozone applications"
​In the 2013 Waked SI et al. study, the researchers sought "to evaluate the efficacy of ozone therapy in breast cancer-related lymphedema". Background on lymphedema: "Breast cancer-related lymphedema is a serious condition that often causes pain and disability and can predispose patients to life-threatening complications, such as, infection, limitation of function, loss of body image and self-esteem, affective disorders and fear. Physical morbidity ... includes decreased shoulder mobility and neural tissue injury causing sensory and motor dysfunction. All lead to diminished quality of life and limitations in activities of daily living of the upper limbs." The researchers decided to use an oxidative therapy, namely ozone, to combat lymphedema. "Recent research suggests that lymphedema might be improved by high-pressure oxygen therapy. The use of oxygen might stimulate the growth of new lymphatic channels and reduce the scar tissues surrounding existing lymphatic channels leading to reduction of limb volume. ....Ozone is a naturally-occurring configuration of three oxygen atoms ... Ozone manifests bactericidal, virucidal and fungicidal actions that might make it a treatment of choice in certain conditions and an adjunctive treatment in others. Ozone reacts with blood generates pharmacological messengers such as hydrogene peroxide, and lipid oxidation products, these activate several biochemical pathways in blood cells, which are responsible for therapeutic activities lasting several days. The result is improved red blood cell oxygen delivery, activated white blood cell immune response, platelet release of growth factors, endothelial release of nitrous oxide, release of stem cells from the bone morrow, and the upregulation of antioxidant enzymes in the various organs. Some recent studies demonstrated that, ozone significantly increases the amount of platelet-derived growth factor, transforming growth factor b1, ,and interleukin-8. These factors are released in a dose-dependent manner and are considered as proinflammatory and enhance angiogenesis of lymphatic vessels." In this study, sixty breast cancer patients with lymphedema were placed in two groups: "The ozone group received ozone therapy in addition to complex physical therapy for lymphedema consisted of pressure garments, remedial exercise, and skin care, while the control group received complex physical therapy only." The ozone group received their ozone via rectal insufflation, up to 32 treatments in twelve weeks. Results: While pretty comparable physically at the start of the experiment, the two groups similarly had a reduction in limb volume at twelve weeks. However, "The trend was more significantly pronounced in ozone group than the control group. There was significant reduction in skin and subcutis thickness in both groups. The rate of thickness reduction was more observable in the ozone group than the control group." Conclusion: ""Ozone may be clinically effective in reducing limb volume and subcutaneous thickness in patients with breast cancer-related lymphedema. So ozone therapy could be considered as an adjunct therapy in addition to gold standard therapy that includes manual lymph drainage, compression garments, and skin care in the treatment of women with breast cancer-related lymphedema." EDITORS' NOTE: THIS METHOD USES AN OZONATOR, NOT WITH MEDICAL OXYGEN. THUS, ONLY AMBIENT AIR IS USED. HOWEVER, MOST OZONE PRACTITIONERS DO USE MEDICAL OXYGEN TO OZONATE. ​Purchase large plastic bags (50 gallon or larger) meant for leaves or trash. You should be able to stand in one and have it come just over the waist. Also purchase a roll of 1/2 inch masking tape (tan color). Your ozonator should have been tested for nickel emission even though you will NOT breathe it and also have black rubber tubing replaced. Ozonate after a hot shower. The shower is not essential. This lets the ozone penetrate the skin, without you getting chilled. Place the ozonator on the floor beside a comfortable chair. Set the tape, scissors, twist ties beside you. It is not necessary to undress. Cut a small hole, just big enough to let the ozonator hose through the bag, about half way up the front. Tape the hose tightly to the bag so no ozone can escape there. Leave it attaches; no need to take it apart each day. You should NOT be able to smell the ozone. Standing in the bag, tighten it around your upper waist; then twist it. Fold it down. Do not tape to skin. Sit down. Turn on the ozonator. The bag will begin to puff out in 5 or 10 minutes. It must puff out to show you there is pressure inside. Change position a lot to stay comfortable. Sitting on the edge of the chair or leaning back does not make a difference. If your illness is very advanced, try to ozonate for 1 1/2 to 2 hours, 2 or 3 times a day. It will kill parasites, bacteria, and viruses altogether without side effects. EDITORS' NOTE: TO REITERATE, THERE ARE MANY WAYS TO USE OZONE. PLEASE CONSULT WITH A KNOWLEDGEABLE MEDICAL PROFESSIONAL BEFORE PURCHASING OR USING ANY OZONE DEVICE!